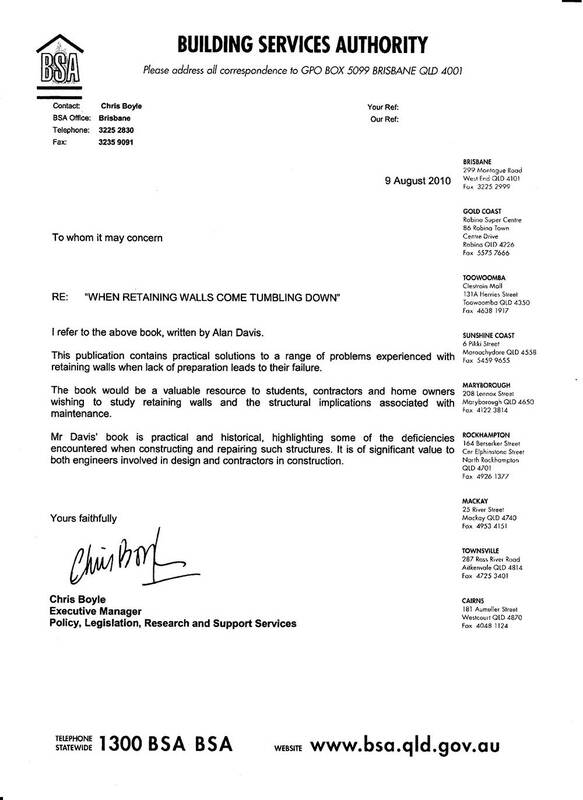 Thank you for your letter of 5 October 2009 to the Hon Kevin Rudd MP, Prime Minister, Conceming your book “When Retaining Walls Come Tumbling Down”. As the matters you have raised fall under the education portfolio, your letter has been referred to the Hon Julia Gillard MP, Minister for Education, who has asked me to respond on her behalf. You would be aware that there are currently a number of work place units of competency contained in the CPC08 Construction, Plumbing and Services integrated Framework Training Package which underpin training for people who construct retaining walls. Training in these areas is often conducted through the Technical and Further Education (TAFE) system. The TAF E system is a State and Territory govemment responsibility. Consequently it would be necessary for you to make contact with the appropriate area within that system in each State and Territory with a view to discussing the possibility of having your book taken up as a training text. Your interest in training future works in the important area of retaining wall construction is commendable. Thank you for bringing the availability of your publication to the Minister’s attention. Finally, let me congratulate you on writing the book. It is extremely important that experiences like yours are not lost and beneﬁt younger generations. 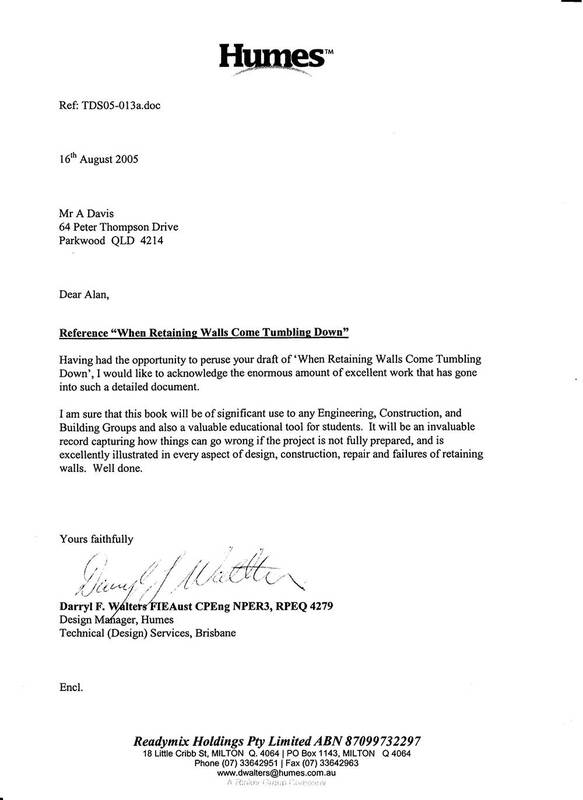 “Thank you for your letter dated 23 March regarding your published book, ‘When Retaining Walls Come Tumbling Down’. 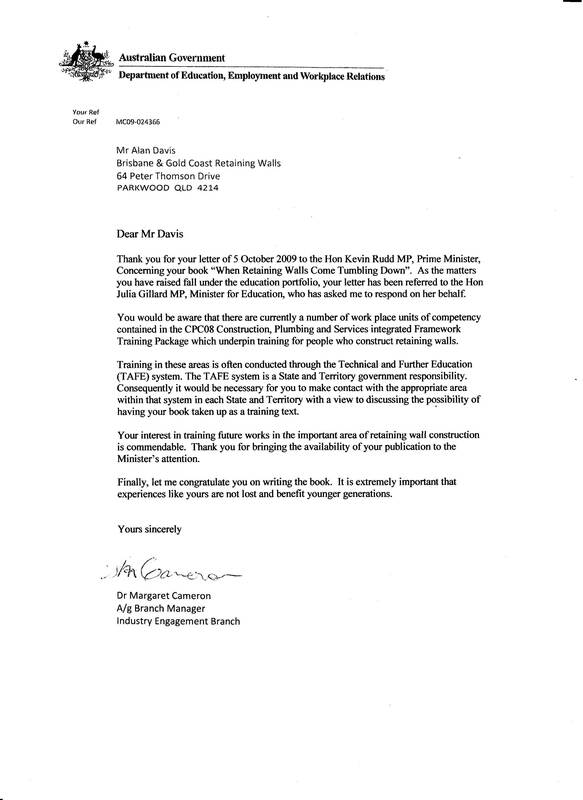 The Honourable Geoff Wilson MP, Minister for Education and Training, has asked me to respond to you on his behalf. 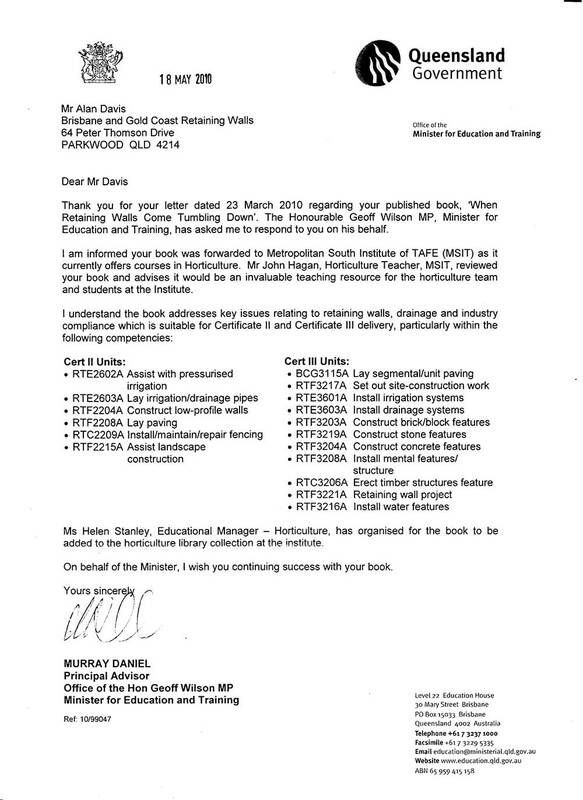 l am informed your book was forwarded to Metropolitan South Institute of TAFE (MSIT) as it currently offers courses in Horticulture. Mr John Hagan, Horticulture Teacher, MSIT, reviewed your book and advises it would be an invaluable teaching resource for the horticulture team and students at the Institute. “I refer to the above book, written by Alan Davis. 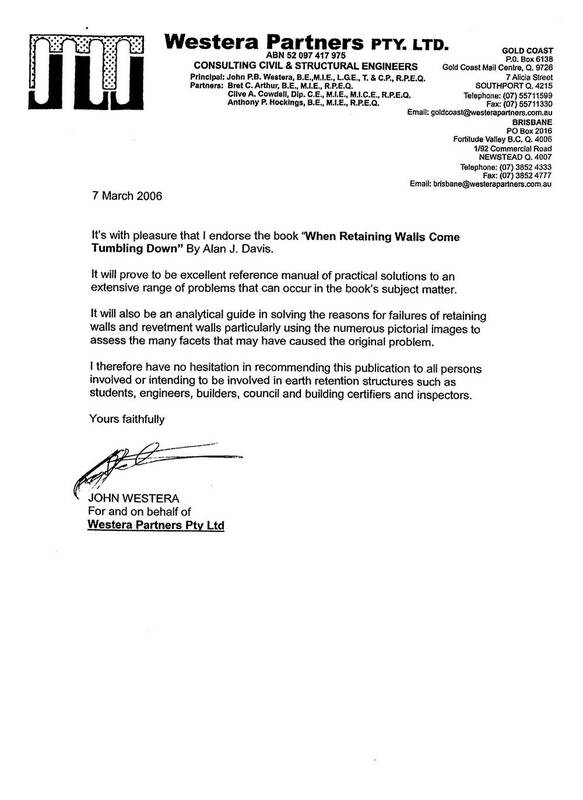 This publication contains practical solutions to a range of problems experienced with retaining walls when lack of preparation leads to their failure. The book would be a valuable resource to students, contractors and home owners wishing to study retaining walls and the structural implications associated with maintenance. 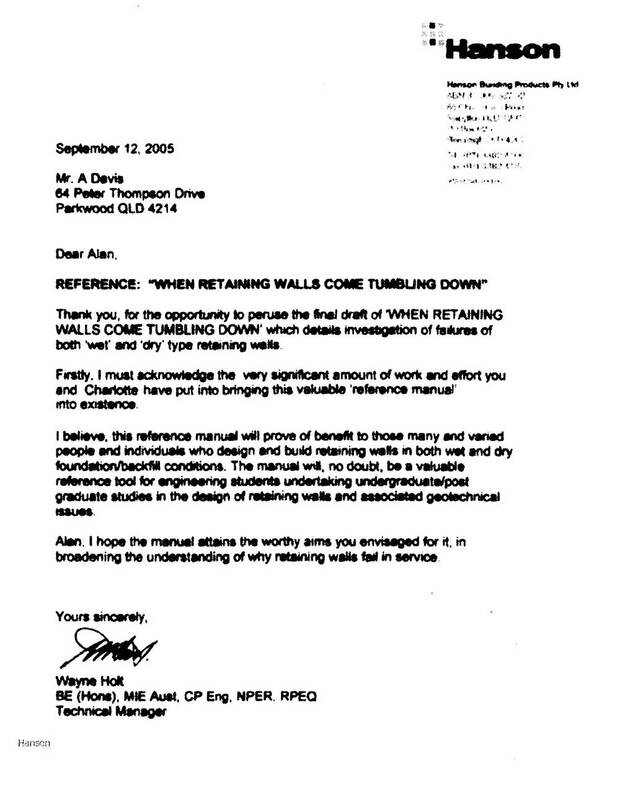 “it’s with pleasure that l endorse the book ‘When Retaining Walls Come Tumbling Down” By Alan J. Davis. It will prove to be excellent reference manual of practical solutions to an extensive range of problems that can occur in the book’s subject matter. It will also be an analytical guide in solving the reasons for failures of retaining walls and revetment walls particularly using the numerous pictorial images to assess the many facets that may have caused the original problem. 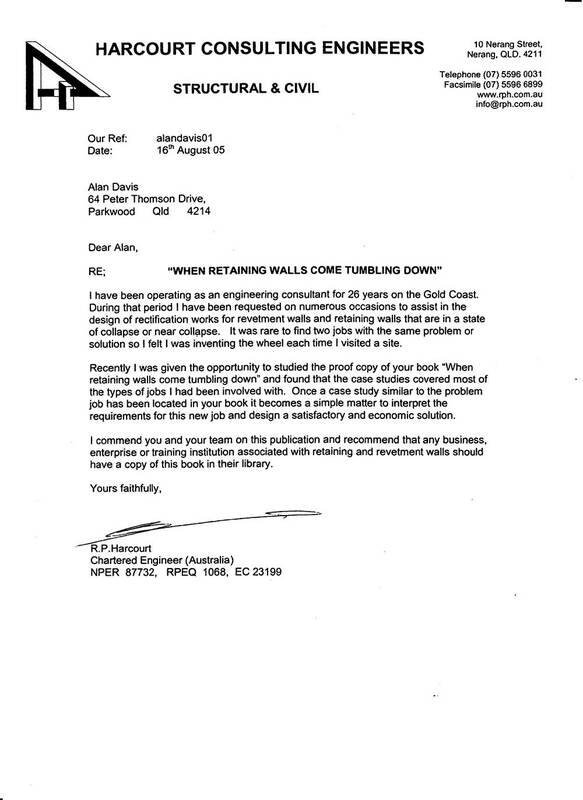 “Recently I was given the opportunity to studied the proof copy of your book “When retaining walls come tumbling down” and found that the case studies covered most of the types of jobs I had been involved with. Once a case study similar to the problem job has been located in your book it becomes a simple matter to interpret the requirements for this new job and design a satisfactory and economic solution.